Cement, commonly used for normal construction work, is known as Ordinary Portland Cement. However, for use under specific conditions a variety of Ordinary portland cement and its composition are available these days. Its quick setting property, strength and case with which it can be used under variety of conditions has revolutionized the concept of construction and made it the most popular cementing material. It was first of all introduced in 1824 by Joseph Aspdin, a brick layer of Leeds, England. 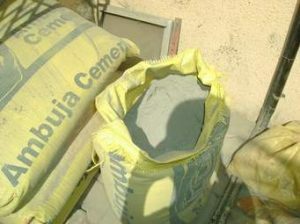 On setting, the colour of cement resembles the colour of rocks near Portland in England and hence the name of this cement. Below are discussed the composition, manufacture and tests etc. of Ordinary Portland Cement. All the above compounds undergo some chemical combinations during the process of burning and fusion. Main constituents of cement are Tri-Calcium Silicate (3 CaO.SiO2). Di-Calcium Silicate (2 CaO.SiO2) and Tri-Calcium Aluminate (3 CaO.Al2O3). Tri-Calcium Silicate is the best cementing material and the more it is present in cement the better the cement is. In a properly burnt clinker Tri-Calcium Silicate should be about 40%. In case the burning is not done properly then the clinker shall have less of Tri-calcium Silicate and more of free lime. After the addition of water to cement it sets and hardens due to the hydration and hydrolysis of the above three compounds which act as a glue. The aluminate is the first to set and harden. Tri-Silicate is slower and the Di-Silicate is the slowest. As such the initial setting of cement is due to the action of aluminate. Further early gain in strength is due to Tri-Silicate. Di-Silicate takes 14 to 28 days to add to the strength. All the three compounds in their action with water give out heat. Maximum heat giving compounds is the aluminate which is responsible for most of the undesirable properties of concrete. A cement having lesser aluminate shall have lesser initial strength but higher ultimate strength. Also there shall be lesser generation of heat, more volumetric stability, lesser cracking and more resistance to acid attacks. Incomplete burning of clinker leaves free lime in it. This free lime causes expansion and disruption of concrete after use. The silicates form a gel with water. The gel later on crystallises and firmly binds the particles. shall not be less than 0.66 and not more than 1.02. (2) Ratio of percentage of alumina to that of iron oxide shall not be less than 0.66. (3) Weight of insoluble residue shall not be less than two per cent. (4) Weight of magnesia shall not be more than six per cent. (5) Total sulphur content calculated as sulphuric anhydride (SO2) shall not be more than 2.75 per cent. (6) Total loss on ignition shall not be more than four per cent. Three Quick Tips For Manufacturing Of Cement.